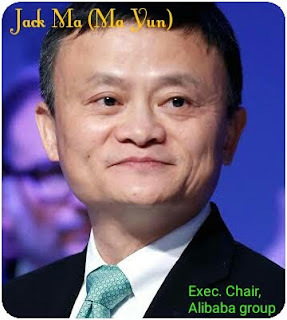 Musings 'n scribblings of a philanthrope .. : Jack Ma on the 3Qs of the human body and the third technology revolution ..
Jack Ma on the 3Qs of the human body and the third technology revolution .. The Chinese business magnate Jack Ma was recently speaking at a conference where he spoke of the 3Qs of the human body. All of us are aware of the IQ and the EQ. But how many of us are aware of the LQ - love quotient ? Jack says that it is this quotient that is going to help the world survive for the next thirty years. The first technology revolution released the human body from the bondages of hard and heavy work and gave him leisure, free time and improved productivity. The second technology revolution concentrated around transportation and gave the humans the ability to cover distances by automobiles, trains, planes etc.. The third technology revolution revolved around knowledge and wisdom, the developments surrounding Information Technology and its effective use have taken mankind a lot ahead. People and countries have stated competing with each other based on the knowledge they have or they can generate, not based on how they could leverage the muscles and conquer distances. These are thoughts from a very plain headed person who is one of the top rich persons on planet earth and leading the world in e-commerce..